The Shore area of Leith has become a culinary Mecca for foodies since its redevelopment and gentrification over the last few decades. You wouldn’t expect anything less from an area with three Michelin-star restaurants in spitting distance of each other. VDeep fits in perfectly with its foodie neighbours. Comedian, presenter and (now) restaurantuer Hardeep Singh Koli’s Leith curry (and craft beer) house VDeep has only been open a few months, but has made a massive impact to the foodie scene at the Shore. That’s mainly because this is no ordinary curry house. You’re not going to find a bog-standard korma on the menu. 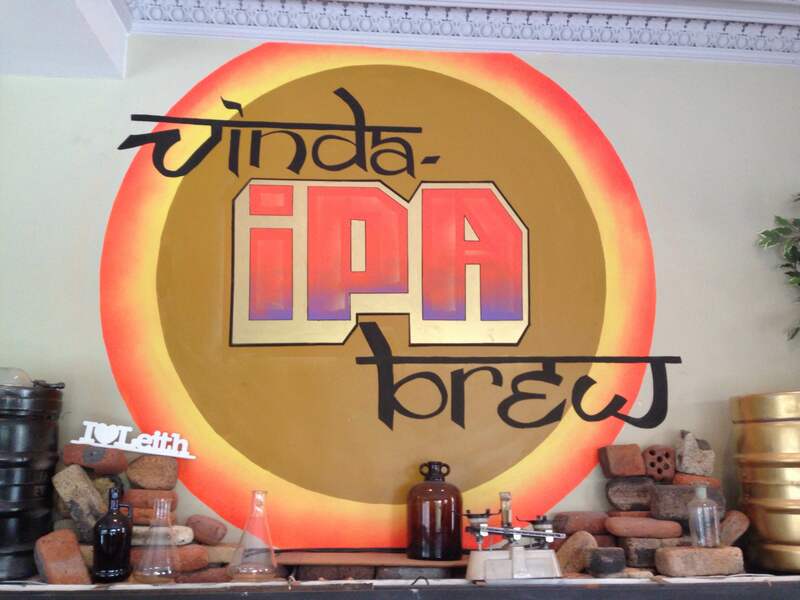 This is VDeep – a fusion of cultures, where East meets West to create Scotland’s first communal curry and craft beer bar. So what makes VDeep different? Hardeep had a revelation. Scots like curry. Scots like craft beer. Unfortunately, there was nowhere that served both, so he decided to fix this problem. However, he didn’t do simply by serving craft beer at a curry house but took it a step further. VDeep is about sharing, about enjoying and about celebrating the mixing-pot of Scottish culture. Right, everywhere says they serve fusion-style food nowadays but VDeep really means it. The ‘East v West’ section of the 21-dish menu boasts real fusion with offerings like curried cauliflower cheese, Kohli Fried Chicken and Bubble & Sikh that actually put the possibilities of fusion to the test and come out the other side. If your mouth isn’t watering yet, it should be! Hardeep has styled the restaurant with sharing in mind. We’re not just talking about the dishes but the tables, the layout and every ounce of the atmosphere. The kitchen is open, so when he’s not mingling with the guests, he’s behind the stove, tweeting out pictures of the guests enjoying their food. Oh, if you thought this was a ‘celebrity restaurant’ where the owner is nowhere to be seen, think again. Hardeep is about as hands-on as you can get. He’s cooking the food, he’s telling you jokes, he’s taking your order and in our case – he’s picking your dishes! When we went in with a group of eight, Hardeep boldly told us that if we told him a bit about the kinds of food we enjoyed, he’d take care of the rest – which he did and it was totally worth it. To be honest, we ended up sampling a large proportion of the menu, but there wasn’t a single dish that wasn’t spectacular. With every dish that came out – from the simple staff curry to the the more elaborate Keralan rainbow trout – we were sharing Hardeep’s perfect world of curry and craft beer. This is his dream and he wants you to be part of it. The restaurant is designed with sharing in mind! From the moment you open the speak-easy door and step into VDeep, you know you’re about to enjoy something special. This is Hardeep’s dream but it is made into a reality through his team of knowledgeable and friendly staff. It’s not the type of place you’re afraid to ask questions or made to feel out of place. You are made to feel welcome, you’re made to feel like you’re at home. It doesn’t even have to be a Friday night – like brunch? VDeep’s fusion continues to encompass Sunday brunch so you can go in an enjoy a Full Indian! Seriously, you shouldn’t have another curry until you’ve eaten at VDeep. Book yourself a table, order a lovely beer and tuck into some of the best Indian food you’ll ever eat. Visit www.vdeep.co.uk to book online. Fallen for VDeep and want to visit Edinburgh? Dickins have beautiful apartments around Edinburgh in all the places you want to be! Why not search for the perfect home from home and then book a table at VDeep? Search our fabulous properties and start your Edinburgh adventure!